The single-use bags are produced by classified suppliers, according USP guidelines and using USP class VI materials. Sensors are fully disposable, for pH a long shelf-life (traditional) glass electrode is applied, which shows stability and low drift during long period of operation. 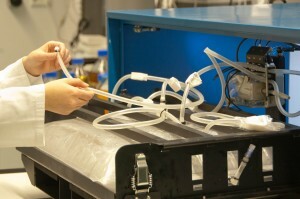 For DO, a polarographic disposable sensor system is applied, where the membrane is disposed and the electrode part reused. Mounting the electrode is done at the non-sterile side of the bag. It is possible to integrate other sensors like a glucose / lactate sensor as well, or a biomass sensor. Other modifications to increase performance are possible. Other options are a connection for perfusion or a sparger option. 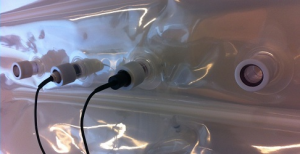 This flexibility of the bag design is one of the advantages which comes with the use of single-use bioreactor bags.